Come join us for the upcoming 2016 presentation party on January 31, 2016!!! Thanks to those friends and supporters who came and celebrated with us on 2013, 2014 & 2015. Here are some photos to share, just click on Previous Party Photos. Welcome to Red Envelope Giving Circle !!! We are happy to announce this grant cycle's grantees! Domestic Violence Prevention Project - South Asian LGBTQ domestic violence project aims to: increase access to culturally and linguistically aligned help services, work with existing domestic violence organizations, engage South Asian community in prevention education and community awareness, train South Asian LGBTQ survivor advocates. API TransFusion - The second retreat for API transmasculine people to build community, develop self-acceptance and self confidence, share resources, and leave energized to live authentically and with pride. Home of the Aetas - Documentary about Jhane, a trans female activist, who organizes her indigenous Aeta community in the Philippines against the government's plans to destroy their ecosystem and construct a mega metropolis. Nenci - Production of an EP called "Tomorrow, For Sure" that features 5 songs about a journey of interpersonal identity, trauma and romantic endeavors by 2 queer non-binary Asian artists. Brothers - A short film about being Asian American and gay in rural California. 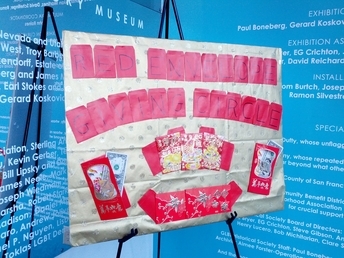 The Red Envelope Giving Circle (REGC) is committed to creating positive social change in the Greater San Francisco Bay Area through philanthropic support to improve the lives of Asian and Pacific Islander LGBTQ people and communities. We invite you to join us in our philanthropic efforts! Be part of something bigger! Start a new movement! Make your voices heard! Contribute to the API LGBT community in the San Francisco Bay area. You decide which organizations are next year's grantees.